HPSC AP Interview Call Letter 2017 - HPSC Assistant Professor / College Lecturer Final Result Merit List 2017 Interview Rejection List www.hpsc.gov.in - HPSC Assistant Professors (College Cadre) Admit Card/ Result 2017 - www.hpsconline.in. HPSC AP Latest News (28.10.2017) - HPSC has uploaded the result of Assistant Professor College Cadre for Economics, Home Science, English & Public Administration subjects on official website www.hpsconline.in. 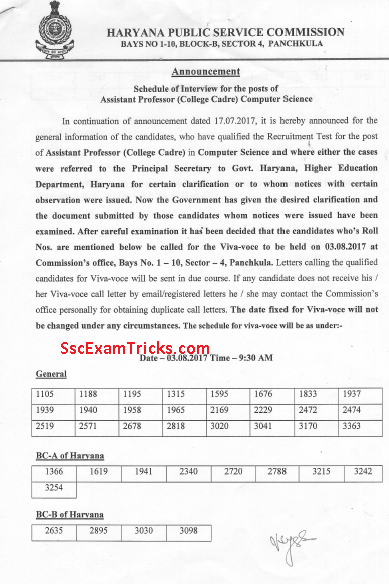 The updates are that Haryana Public Service Commission has uploaded the marks list of Assistant Professor of the Sociology. The candidates can download the scorecard/ marks from the link given in the box. Criteria for the posts of Assistant District Attorney in Prosecution Deptt. Marks list for the posts of Assistant District Attorney in Prosecution Deptt. The interview letter for Assistant Professor of Geography & Computer Science has been sent by post to the correspondence address of the candidates. The good news is that Haryana Public Service Commission has uploaded the rejection list of candidates after the interview. 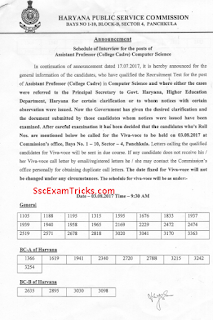 Three lists of candidates in which roll numbers are given and these candidates must report to the venue within next 10 days or before 03rd August 2017. 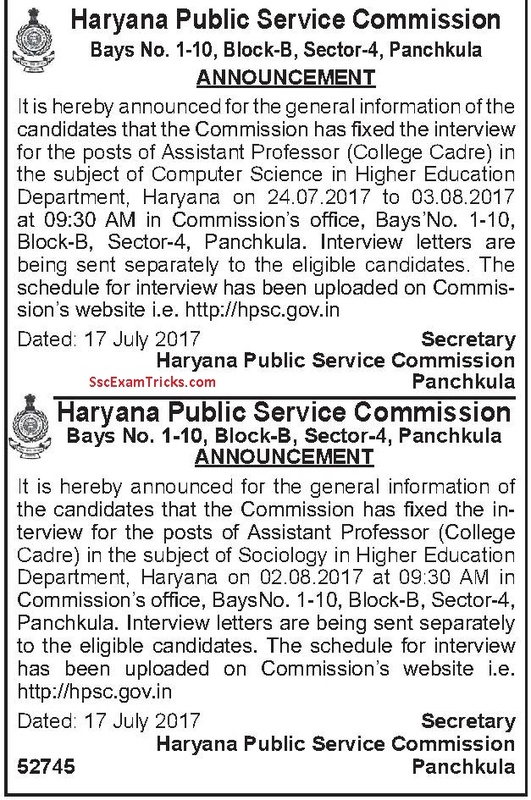 Haryana Public Service Commission has announced the interview dates for Assistant professor in College Cadre for the subjects of Sociology and Computer Science. Regarding Examination for the posts of HCS (Jud. 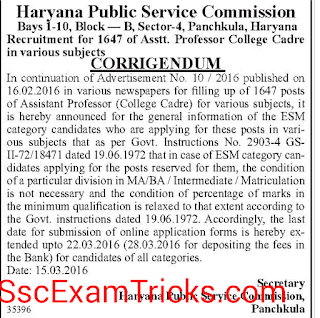 Branch) - 2017Haryana Public Service Commission (HPSC) had released notification and invited from applications for posts of Assistant Professors (College Cadre). The selection process will be made through Exam test. 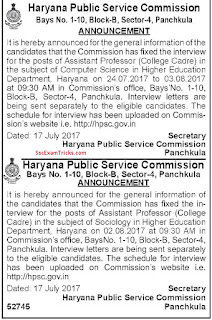 Haryana Public Service Commission (HPSC) has released online admit card on 29th June 2017 for Exam to be held on 09th July 2017 at various Exam centers for the posts of Assistant Professors (College Cadre) – 2016. 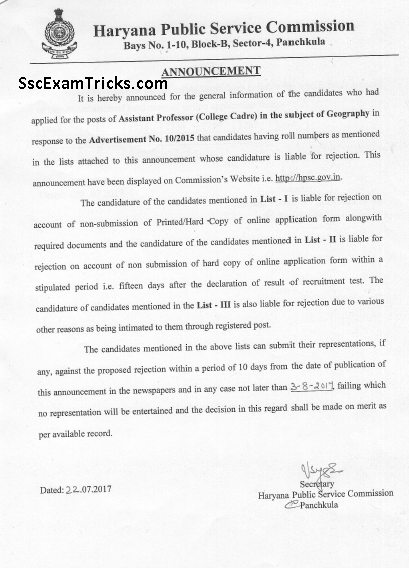 Those candidates who had applied for these posts and waiting for their HPSC Assistant Professors (College Cadre) Call letter they can download it from direct link given at the end of the page. 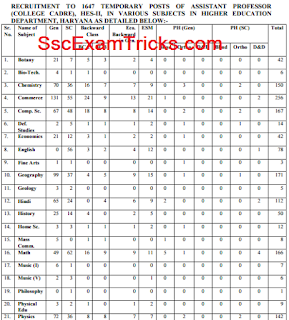 HPSC AP Final Result 2017 Download Interview Result 2017 – Download Haryana HPSC Assistant Professor Appointment Letter 2016-17 – Check Haryana Public Service Commission College Lecturer Final Merit List 2016-17 – HPSC Assistant Professor/ Lecturer (College Cadre) Result / Scorecard Final Merit List Appointment/ Joining on hpsc.gov.in. 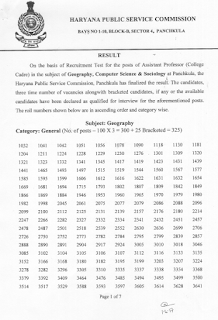 Haryana Public Service Commission has declared the written test result of Assistant Professor Geography College Cadre on official website. The list of candidates selected for interview has been uploaded on the official website. The intimation for interview will be published soon. 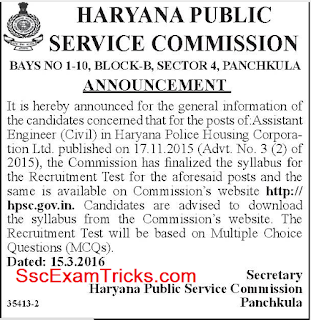 Haryana Public Service Commission has uploaded result of assistant professor hindi college cadre on the official website. 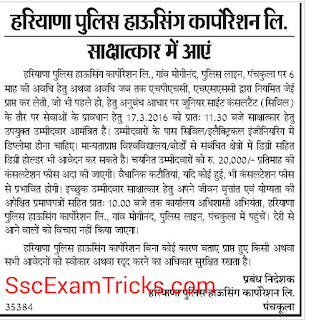 HPSC has uploaded list of selected candidate category wise on the official website in which 251 candidate selected for general category, 86 candidate selected in schedule caste category, 24 candidates selected in physical handicap (OH+VH), 13 candidates selected in BCB and others. The details are given in the image provided below. The successful candidate called for interview for which the dates will be notified very soon on the official website www.hpsc.gov.in. 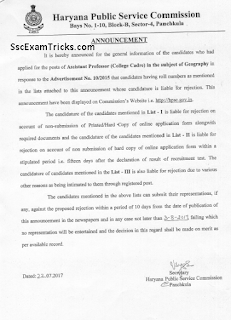 The selected candidates are required to send hard copy of their online application along with self attested certificate supporting documents to the commission to the address of commission office (given below) registered post by hand up to 12th May 2017 till 5 p.m.
HPSC, Bay number 1 to 10, block B, sector 4, panchkula (Haryana). About 3 time number of vacancies including bracketed are called for interview. The roll number wise list of selected candidates shown in the images is in ascending wise and category wise. The final selection will be made by three simple stages; Certification, Screening Test and meeting process. First, all testimonials will be checked and verified by the officials and second, screening test will be scheduled to be organized to shortlist the suitable candidates. Meeting may or may not be held for these posts. 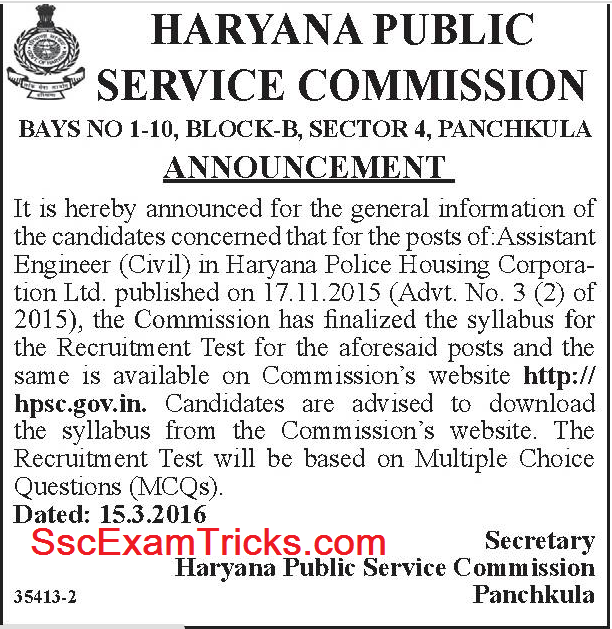 HPSC Assistant Professor screening test date (written test date) will be announced very soon on the official website. HPSC College Lecturer screening test syllabus is not decided by the board. However, the screening test may be an objective type test of MCQ paper (with four alternative answers as options/ choice) in which questions may be asked from general aptitude and specific subject. The result may be announced with marks obtained by the candidates. The qualified candidates will be shortlisted for further process. 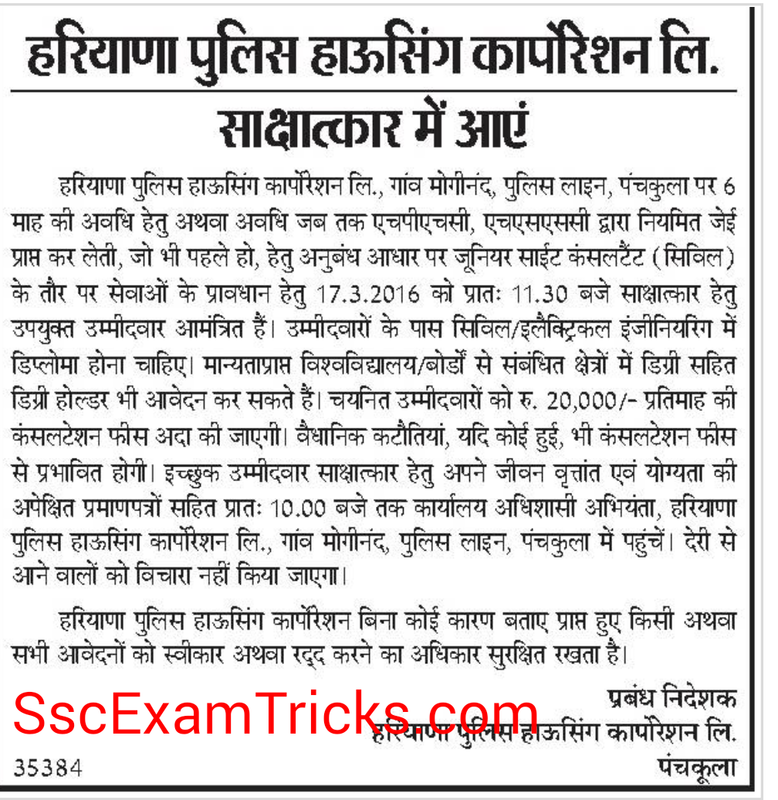 HPSC Police Interview 2016: Haryana Police has organized interview on 17.03.2016 at 11:30 am. Read the full detail in the image provided below. The final merit list of the selected candidates will be prepared from screening test followed by certificate/ document verification of the candidates. The selected candidates will be required to join duty immediately after receiving the offer of appointment. No other concession such as rent free quarters etc. is admissible. The reserved vacancies will be filled up separately from amongst the eligible candidates with disabilities which will thus comprise physically handicapped candidates how are lower in merit than the last candidate in merit list but otherwise found suitable for appointment, if necessary, by relaxed standards. It will apply in case of direct recruitment only, wherever reservation for persons with disabilities in admissible. The posts advertised are temporary basis but may be continued. 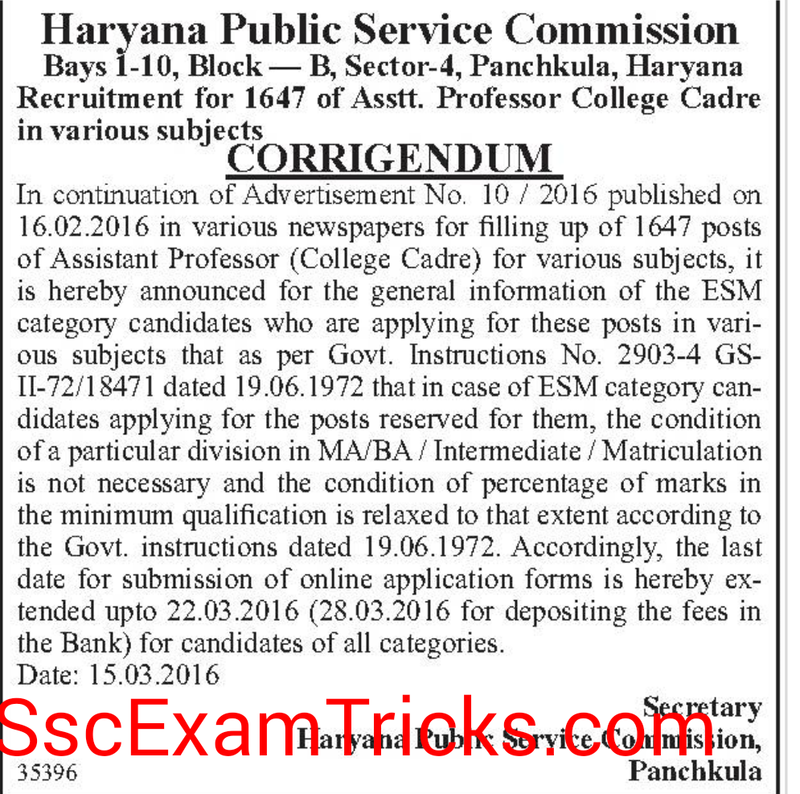 Latest News (16.03.2016): HPSC has published latest corrigendum on 16.03.2016 and extended last date to apply online for 1647 Assistant Professor posts up to 22nd Marxh 2016 and last date for dwpositing application fee in the bank up to 28.03.2016. Read the full corrigendum in the image given below. 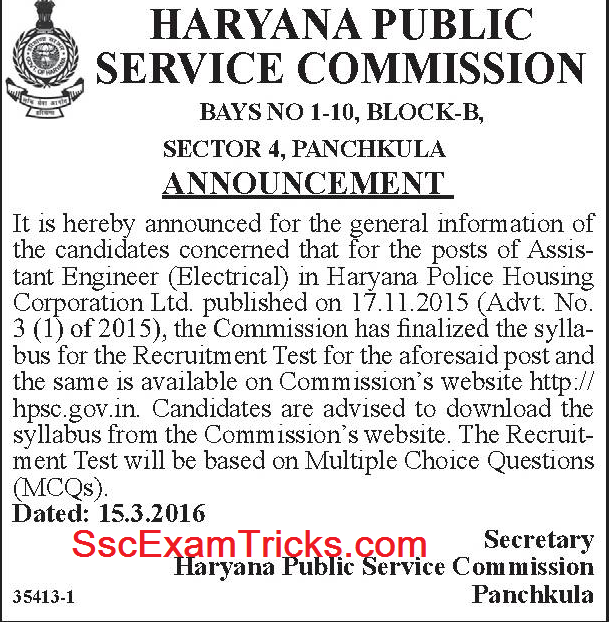 Haryana Public Service Commission (HPSC) is preparing for conducting screening test in upcoming days for recruitment of 1642 posts of Assistant Professor (AP) in various subjects across the state. Earlier HPSC had started online registration to those candidates who had completed master’s degree in relevant subjects (55 % Marks) up to last date 15th March 2016 on hpsc.gov.in. The end date to fill application fees (Rs. 500/-) for General and Rs. 125/- for SC/ BC/ Female/ ExS) was 18th March 2016. No hard copy of application form was required to send to the office. A huge numbers of eligible Indian citizens had applied for these vacant posts and those candidates who are waiting for their HPSC Assistant Professor Admit Card 2016; they can download their HPSC Teachers screening test call letters from direct link given here. 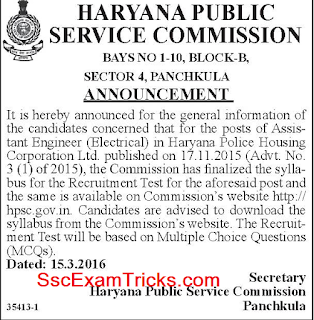 You must login your account prior to download your HPSC AP Interview Call Letter 2017 and Haryana Civil Services Assistant Professor Result/ Merit List 2016-17. It is compulsory to provide login details (registration and password) on the official website www.hpsc.gov.in. Click on the direct link which will be given there. Download your HPSC AP Screening Call Letter with some important instructions mentioned on it.